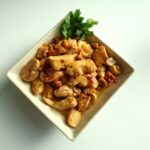 Here are some menu suggestions for quick meals that you can enjoy any day of the week, at lunchtime or for a simple supper, whether you’re cooking for one, two or more. Most include the simplest of French desserts — cheese and fruit. Total preparation time should be no more than 20-30 minutes, or a bit longer if the dish involves roasting. I am curious to know how you serve your dinners, both everyday meals and special ones. I suspect you don’t put all the serving dishes on the table and let people help themselves, American family style. Is the salad always served as a separate course, after the main dish? Is there bread and butter on the table? How do you serve a fruit course, and a cheese course? Thanks. Thanks for your suggestion, Ann. The dishes in the menus are all linked up to their recipes now. And weekend menus have been added to the site as well! Love this idea, Meg. It would be wonderful to have the dishes in the menus as links to their recipes, so one can contemplate, click, and cook!